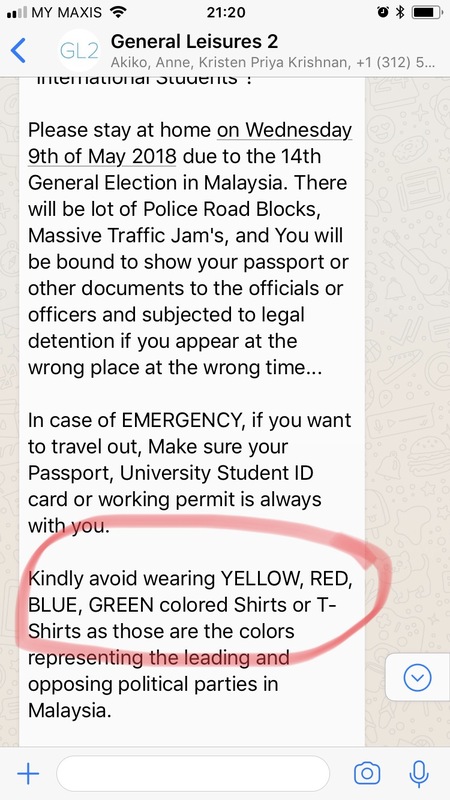 Elections in Malaysia are positively biblical – you have to return to your home town to vote; you can’t vote in the town where you currently live. I don’t think you actually have to travel there on the back of a donkey, but it’s still a pretty archaic system for the 21st Century. 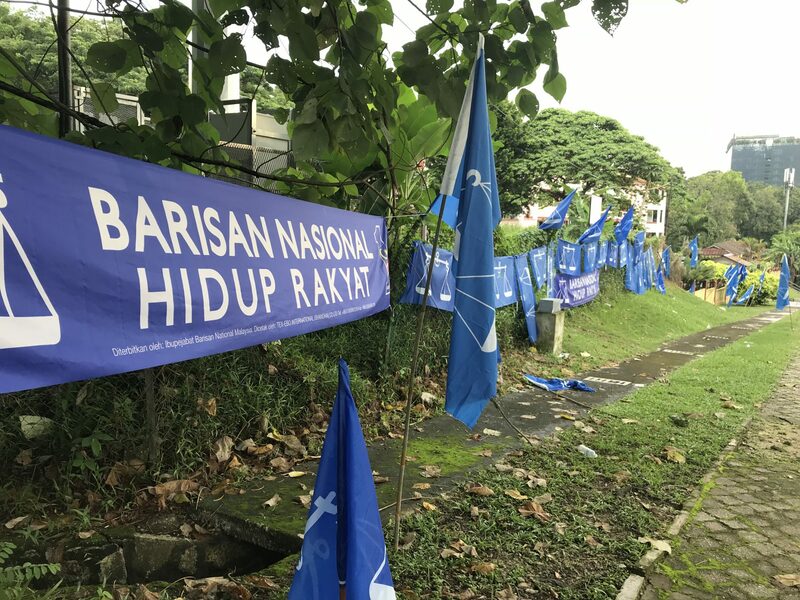 The General Election, or GE14 as it’s being called, is on Wednesday, and the entire country is covered in flags and banners – most supporting the ruling party. There are at least a thousand flags between my condo and the school, so I can’t begin to imagine how many there are covering the entire country. Unlike the UK, there are no flags in people’s gardens or front windows, showing an individual’s support for a particular party. All the flags here are on public streets, fences, railings, lamp-posts, covering every square inch of non-private land. The local paper reported that they were put up by party-faithful ‘thugs’ and I wonder if they’ll bother to take them down again afterwards, or just leave them to fester and rot in the heat and the rain. I’ve already been warned by several locals not to go out on Wednesday or Thursday, in case there are riots. However, other people I’ve spoken to have scoffed at the idea of riots, on the grounds that the Malaysians are far too lazy to riot. So I’ve decided to dress entirely in black for the whole of next week, just to be on the safe side. There’s a lot at stake in this election – especially for the current Prime Minister, who’s been embroiled in a lot of unsavoury scandals recently. And the leader of the main opposition party is 94 years old, so I imagine this will be his last crack at the top job. 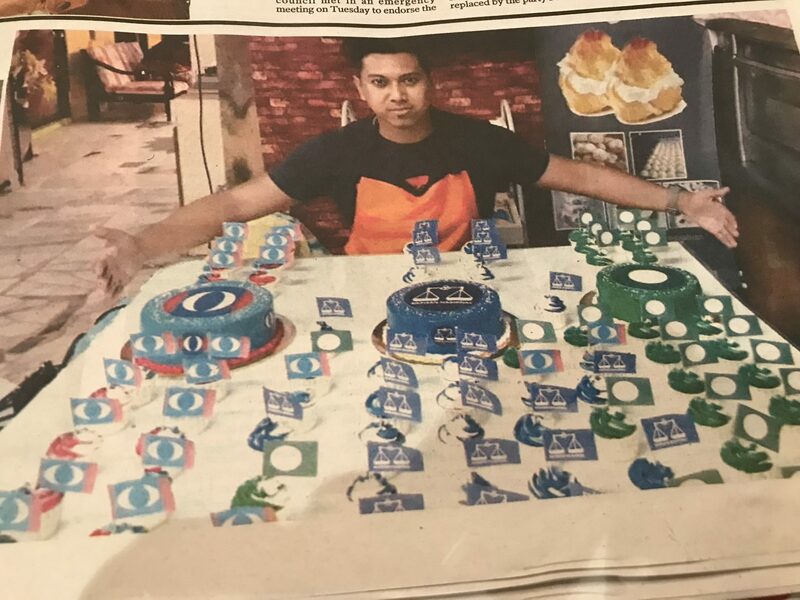 But Malaysia being Malaysia, it’s actually all about cake and public holidays. Wednesday has been declared a public holiday because it’s election day (of course) and the ruling party has promised that if they win, they will declare Thursday a public holiday too. However, if the main opposition party win, they have said that they will declare Thursday AND Friday as public holidays … so they definitely get my vote. eat your way to victory – and to hell with the fact that 17.5% of the population here has diabetes. Previous Previous post: Hooray for another public holiday!